At its heart FRIENDS AND ROMANS is a warm, sincere, and funny story about Nick Demaio (Michael Rispoli), an Italian-American actor (glorified extra, really) trying to break free of typecasting in bit gangster roles to do work he can be proud of. 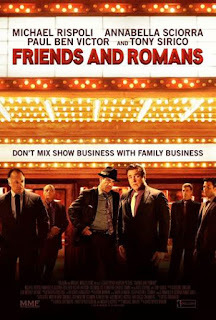 Unfortunately that doesn’t always mesh well with the screwball comedy side of the film, a sort of BULLETS OVER OFF-BROADWAY in which Joey Bananas (Anthony DeSando), a real gangster with aspirations to be an actor, winds up playing Brutus in Nick’s all-Italia production of Shakespeare’s Julius Caesar. Nor does it help that the film piles on a few too many subplots of varying interest and believability. Rispoli co-wrote the screenplay with Gregg Greenberg and director Christopher Kublan, and one assumes that it’s at least somewhat autobiographical. Rispoli generally gets better roles with actual lines of dialog than Nick, but he’s still played an awful lot of gangsters (as have several of the supporting players in the film, with more than a few Sopranos alumni on hand). That gives the film a bit of authenticity in its depiction of guys who take the work they can get so they can support their families, but nonetheless feel frustrated that they only get called on to play the same kind of roles again and again. There’s also a genuineness to the scenes of DeMaio’s homelife with his wife Angela (Annabella Sciora), a teacher, and his daughter Gina (Katie Stevens), herself an aspiring actress who is more than a little embarrassed by her dad’s body of work. Although not fatal to one’s enjoyment of the film, a subplot involving Gina winning a role in her high school production of ‘Guys and Dolls’ by playing along when the director mistakenly believes her dad really is a gangster feels like padding, and inauthentic padding at that. And when Nick’s play becomes the target of a police sting operation to catch Joey Bananas, the film comes dangerously close to being too silly for its own good. Nonetheless, there are a fair number of laughs, the cast is likeable, and overall it’s a nice little film. 2 ½ out of 4 stars.